In May, 2013, we performed dual 24″x20″ folding head linestops on 24″ P.C.C.P. in Pittsfield, Mass. on the Coltsville Valve Vault Demolition Project for Northern Construction. 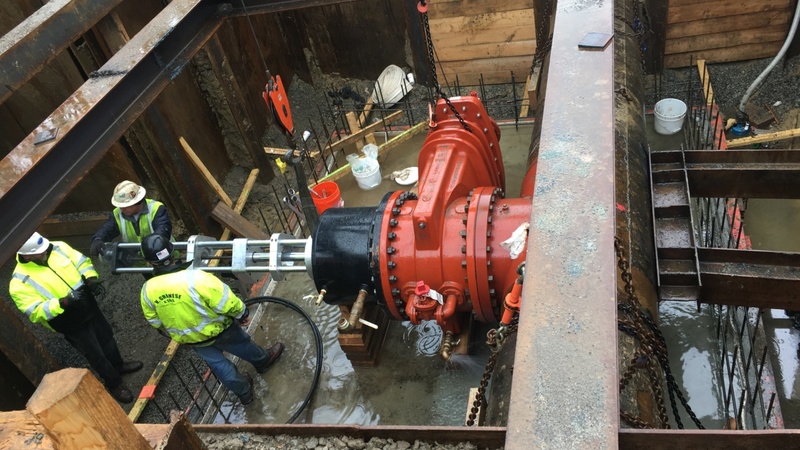 We not only had to do the linestops, but because this transmission main was an integral part of the water distribution infrastructure, we also had to furnish, install and cut 24″ x 16″ taps for a temporary 16-inch bypass. This bypass was utilized when the linestops were in place and the vault was begin demolished. We could have bypassed out of the linestop heads, but I guess there were design considerations with the friction losses so this option was chosed by the Engineer. This transmission main used to be operated at 150 psi which would have meant have to reduce the pressure during certain phases of our work. However, the operational pressure had been decreased to slightly less than 90 psi which meant that no depressurization of the main was necessary. Because we were in the middle of Route 9, the entire job was on a fast track schedule. Every milestone was met and the project was completed in approximately two weeks from the day we began work on site to the day we retracted the linestops. It was a pleasure working with Northern Construction and the staff from AECOMM and hope to have the opportunity to do so again.